Solar panels have a difficult reputation. Some people think they’re ugly and ungainly. Others find them unaffordable, or think the economics involved are too complicated to figure out. It’s not always obvious whether they’re right for your house, or how they ought to be positioned. They’re politically fraught. They’re not something you just go out and buy at IKEA. IKEA, best known for flat-pack furniture and inexpensive home goods, said Monday it is the first mainstream retailer to offer solar panels to everyday customers. Steve Howard, the company’s sustainability chief, said in an interview that the company aims to make the initiative into “a real business” even though selling solar panels likely won’t achieve the level of margin enjoyed elsewhere in the business. Just because they’re available at IKEA, though, doesn’t mean the panels will be cheap, and it doesn’t mean you can easily install them at home. The stores’ solar-panel packages will start at $9,200, and ABC News notes that IKEA will partner with the Chinese energy giant Hanergy to offer customers advice, installation, and service. As for the price, the company’s pitch to U.K. customers will be that the panels will pay for themselves in energy savings within seven years. Whether IKEA will eventually expand its solar-panel business to the United States is not yet clear. A company official told the WSJ it’s a possibility. If IKEA solar panels do arrive stateside, they’ll find a vast market, but also some tougher and more innovative competition than they face in Britain. Not only are solar panels already sold at some major U.S. retailers, like Home Depot, but startups like SolarCity offer customers a tantalizing financial proposition. 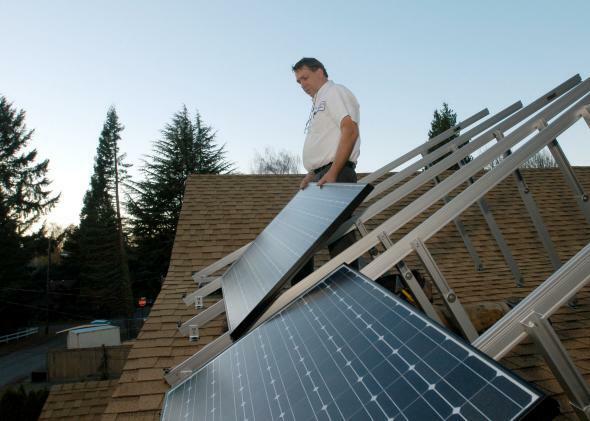 Rather than selling panels for thousands of dollars, SolarCity leases, installs, and maintains them for little or no upfront charge. Then it sells the electricity at a monthly rate, just like a traditional electric utility. SolarCity CEO Lyndon Rive says he welcomes IKEA’s entry into the business. “This is the latest example of consumers’ being increasingly empowered to make decisions outside of the traditional utility electricity framework,” he told me in a statement.